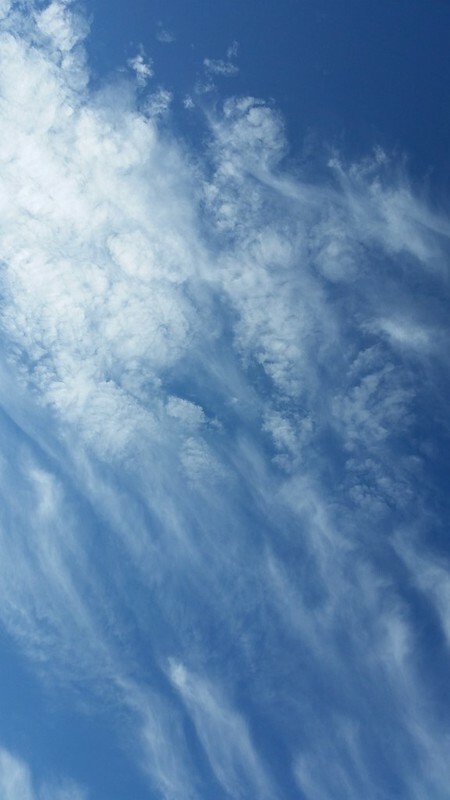 A picture of a lightly-clouded sky. It's not an amazing picture but it is a nice picture. I came outside for a walk and clearing of the head at work and just found this frame of clouds to be refreshing to look at. I think in part because I missed a lot of being outside this past week as I completed the first week of my PhD program. The ability to look up and take in a pretty sky was needed (or should have been taken of advantage of more this past week). The clouds themselves are interesting because you have the more solidly formed in the upper left corner while other clouds look more like streaks or clouds in a state of forming (or deforming). That in itself draws me into thinking about this path I have started to go down in become a PhD student and think about this picture as a transition to and from one state to another. Much of which at this point is abstract or elusive--like a cloud.